The cannabis industry is one of the top emerging industries in Oregon, the U.S. as a whole, and even the globe. As one of the first states to legalize marijuana, after a history of progressive cannabis policies, Oregon is poised to capitalize on an exciting opportunity. The college town of Eugene, home of the University of Oregon Ducks, is a current hotbed of economic activity. A map created by The Register-Guard based on data from state marijuana ­regulators shows clusters of ­marijuana shops forming in Eugene. The most popular areas for the newly ­emerging marijuana ­industry in the city are downtown, west Eugene and near the ­University of Oregon. Available retail space and zoning rules drive the ­decision of where to open up shop, city of Eugene land use analyst Mike ­McKerrow said. “People are ­locating in places where the use is allowed,” he said. Those ­locations include commercial space in the city’s core. Other cities around Oregon, including Portland, have a rule requiring at least 1,000 feet — about 2½ blocks — between each marijuana retailer. 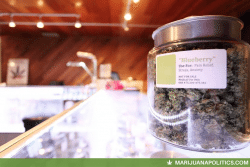 The Oregon Health ­Authority, which still regulates the ­handful of ­dispensaries ­selling ­marijuana only to ­medical marijuana card holders, also requires 1,000 feet between shops. Eugene doesn’t require such spacing for pot shops, and earlier this year the Eugene City ­Council decided to hold off on ­pursuing it. Oregon’s revenue from marijuana sales far outpaced state estimates in 2016, and commerce in 2017 looks to keep pace as well. Business slowed for a bit in 2016 when the state first implemented new testing and packaging policies, but the industry has adapted. There may be a few new changes to the laws this legislative session and regulators taking input on new testing policies until April 30th, so entrepreneurs, business owners and farmers may have to adapt again. However, high quality marijuana, which Oregon certainly produces, will likely keep selling, so long as the state doesn’t overregulate the system, so the future of the Beaver State’s cannabis industry is certainly very bright. The Oregon Marijuana Business Conference (OMBC) on April 28th in Eugene, will be a great opportunity for those in the cannabis industry, or thinking of joining, to learn the latest about new rules and regulations, ask licensed attorneys burning questions, and network with others in the cannabis community. Be sure to get your tickets by April 26th, to save money. Henry Rollins will be delivering the keynote address. The OMBC is the must-attend event for the Oregon cannabis community, so get your tickets today!